Based on a mix of modern philosophy, science, and nearly thirty years coaching top executives, Lolly’s perspective on leadership continues to break new ground and produce exceptional results. Of her many awards and accolades, Lolly was designated a Top-50 Leadership and Management Expert by Inc. magazine. Huffington Post honored Lolly with the title of The Most Inspiring Woman in the World. Her writing has appeared in HBR, Inc.com, Fast Company (Ask The Expert), Huffington Post, and Psychology Today, and others. Listen in as we discuss the 7 gaps and the 7 archetypes that exist for all of us and might be holding you back. What is holding you back from greater success? If I only know what I know, it could be holding me back from who I can become. The only thing that could be holding me back is me. Who do you look to the most for advice? Viktor Frankl. Joseph Campbell. Carl Jung. What is your best personal productivity suggestion? Discipline gives me freedom. What is one thing that has you excited to be working on right now? 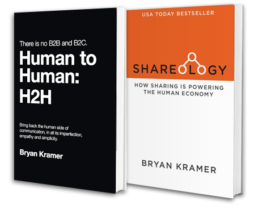 Talking to Bryan Kramer and my book because it is something I am extremely passionate about. If you had to start over tomorrow knowing what you know now but you don’t get to take the money with you, just the knowledge, what’s the first thing you would do to build your career back up? I would ask myself “How can I make an impact today and with who can I serve today?”.